I want to tell you about a really cool course I’ve been taking on Udemy these past couple of weeks. It’s all about aquaponics and how I can create my own little ecosystem in the backyard, where fish and plants will feed off of one another, resulting in two types of organic, natural, clean food for me and my family to enjoy. In case you aren’t very familiar with aquaponic gardening and how aquaponics works, what it’s for, or just aren’t clear on some of the details – here’s a quick introduction before we carry on to the full review of the Aquaponics Gardening course offered by Udemy. In a nutshell, aquaponics is a process which involves fish and plants living together in a closed ecosystem. You’re able to grow plants without soil, and you’re able to keep the water clean for the fish naturally thanks to the plants. The fish will release ammonia into the water, which turns into nitrates, which feed the plants. It’s a brilliant cycle that keeps going around and around, producing fresh and safe food. What Is The Aquaponics Gardening Course At Udemy? This course is a complete guide to the entire aquaponics process, from going to the hardware store and building your aquaponics tank, to preparing your fish in a humane way. All in, there’s over 50 videos and audio files for you to listen to and watch. You can go back and look at any of them again, you can skip ahead, rewind, and it’s all done completely at your own pace. This course starts off with an introduction to aquaponics and helps you make a plan for your own aquaponics system. Then, it teaches you exactly how to care for your food and how to make it thrive. Later, you learn about the various types of hardware you’ll need including pumps, grow beds and fish tanks. It, basically, teaches you everything that one could possibly want to know about aquaponics. If you’re curious in learning more about the course, you can click here or keep reading for more of my impression of this course. This course was put together by a lady named Sylvia Bernstein. She is the founder (and president) of The Aquaponic Source, which is a company dedicated to spreading knowledge about aquaponics. She also runs the biggest online community for people who are into aquaponics, so she really knows her stuff. This isn’t some junky eBook that’s been tossed together overnight by a marketer to make a quick buck. This is the real deal. What Are The Benefits To Taking The Course Online? The main benefit of taking this course online is that you can do it at your own pace, like I mentioned earlier. Some people like to learn about aquaponics simply because it’s so fascinating without having any intentions of making their own aquaponics setup, whereas other people want to get right down to building right away. Whichever camp you fall into is perfectly fine and this course will adapt to meet your own needs and interests. Aquaponics is very appealing to anyone who is concerned with the quality of the food from the grocery store. If you want to eat clean, you’ve got to know where your food comes from. If you want to eat locally, they say your food is supposed to come from within 30 miles of your home. You can’t get much more local than your own yard. What Are The Downsides To A Course Like This? Everyone learns differently, and online courses can feel kind of like a chore sometimes. Also, just hearing somebody explain aquaponics and watching videos about the topic isn’t the ideal way for some people to learn something new. But, if you’re able to pick something up by seeing someone else discuss it and then demonstrate it, this course will be a great fit for you. Otherwise, you may want to take a look at some of the sample materials first just to make sure you’ll be able to absorb all of the lessons. Fish raised in your own yard won’t taste the same as farmed fish, in fact they’ll probably taste better. You can raise many different types of fish, tilapia are among the most popular. 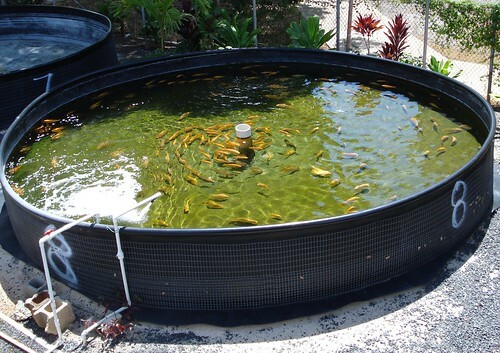 You can grow any number of different vegetables in your aquaponics pond. Aquaponics isn’t suitable to all climates. You will still need to feed the fish with fish food. Overall, this is hands-down the best source of information on aquaponics that I have been able to find. The videos are well made and they are very, very in depth. After spending a lot of time browsing various sources of info, and finding conflicting facts, it’s nice to have everything in one place, put together by one of the nation’s leading experts on the topic. I’m a lot more keen to trust somebody who has dedicated their professional life to aquaponics than to trust some random person who decided to toss up a website one day. If you’re at all curious about aquaponics, and exactly how it works and how you can incorporate it into your lifestyle, I strongly urge you to take a look at the Aquaponics Gardening course by Sylvia Bernstein. You can click here to learn more, and even check out the free sample material to see for yourself how high the quality is. Aquaponics at Home for You and Your Family! Aquaponics 4 You Review – Does It Really Work?